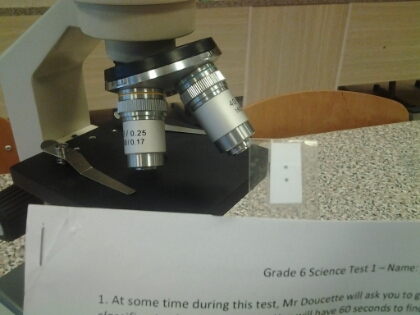 After a life sciences unit that involved a lot of microscope and model-building work, I wanted to give my grade six students a chance to demonstrate their skills and understandings in an authentic way. 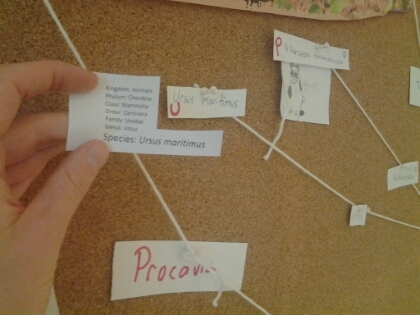 First, the students came one at a time to our tree of life (above) where I gave them the seven-part (Linnean) taxonometric classification for three different species. They had two minutes each to use that classification system to find the three species and note down a letter on the namecard for each of the species. I was a bit of craziness during an otherwise-serious test, but by doing it at the back of the classroom, I don’t think any of the students were distracted. Next, the students used a microscope to look at two very small symbols I printed onto light paper. I designed the symbols in MS Paint (now there’s a program with recurring utility!) and played around with the print scaling until the symbols were too small to resolve with the naked eye, yet still coherent after coming off the laser-printer. Each pair of symbols was taped to the upper corner of the test. The students had to sketch a copy of the symbol. I think this was a good way to determine whether each student was capable of using different objectives, moving the slide, and focusing the microscope. Most of the test was pretty generic: write a paragraph arguing for/against viruses being alive after a reading passage about them, label a picture of a microscope, etc. For the students who finished early, or were stuck on a question, I made a word search on the back of the final page using all the terms I might want to use on the test. This kept things on an even keel for most.. but an hour is a long time to be sitting still for a student of this age. 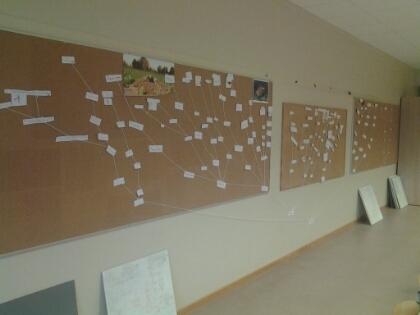 Overall, this took so much work to set up that I am not sure it was worth the cost. This entry was posted in Uncategorized and tagged authentic assessment, microscopes, test, testing, tree of life on December 2, 2014 by Danny.